After the Environmental Protection Agency suspended it from receiving any new contracts following the largest accidental marine oil spill in history, British Petroleum tried to convince the agency that it had fixed its problem and should continue to receive federal contracting dollars. Vice News' Jason Leopold obtained a July 2012 document that outlined BP's argument suggesting that the energy giant should get more government contracts. In the document, BP said it had learned from the 87-day 2010 Deepwater Horizon oil spill that killed 11 people and polluted the Gulf of Mexico by spilling 210 million gallons of oil. "After these accidents, BP enhanced its systems to manage safety and operational issues and oversee the company's safety, compliance and risk management systems and performance," the document stated. The EPA suspended BP from receiving new federal contracts in November 2012, citing the environmental disaster associated with the spill. BP's missive to EPA made clear that it valued its government contracts and that it reworked aspects of its structure to make sure another spill like Deepwater Horizon will not happen. BP does not take for granted its status as a business partner of the Government. BP understands that the government protects its interests by dealing only with responsible contractors. Through all of the remedial actions and measures that BP has implemented, BP has corrected the factors contributing to the Deepwater Horizon accident that were within BP's control. 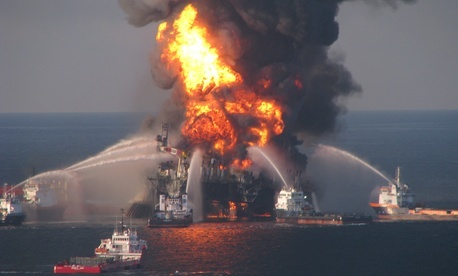 The report enumerated the measures BP has taken to correct the problems that led to the spill. It included sections on "Capping and Containment Technology" and an "Overview of BP's General Ethics and Compliance Program." The document also touted BP's new operator's oil spill response plan. The revised OSRP: (1) contained new deep sea containment planning; (2) improved BP's capability to contain /remove oil from the sea surface through the identification of new in situ burning techniques; and (3) recalculated worst case discharge scenarios with response scenarios incorporating the expanded suite of equipment and technologies developed through the Deepwater Horizon response. The document also detailed the ways BP already works with the government, mentioning the firm's status as the top energy partner of the Pentagon, and cited its long-standing relationships with other agencies. The company "invested $8.8 billion in the United States during 2011," the report noted. In one section, BP said it "was a responsible company with established, effective programs and processes for managing compliance, safety and operational risks," despite reports that the company had routinely avoided federal safety rules. In November 2012, BP pleaded guilty to 11 felony counts related to the deaths of 11 Deepwater workers as part of a $4.5 billion settlement. In August 2013, BP filed a lawsuit against EPA's 2012 freeze on the oil giant's contracting and oil industry groups filed a court brief in support of the case in December 2013. In March of this year, the EPA lifted the ban on BP receiving new federal contracts. Read the full document below obtained by Leopold through a Freedom of Information Act request.